There’s great news. The government has opened more than 8,400-square miles of the Gulf of Mexico for fishing. This coming weekend is the last 3 days of the special fall red snapper season in the Gulf of Mexico, and anglers who come to Orange Beach, Alabama, this weekend may have an opportunity to fish these waters that no one has fished all spring and summer. The big wahoo often are caught in this area of reopened fishing waters. Many of the offshore rigs that historically have held yellowfin and blackfin tuna will be opened, and almost all the waters that the captains at Orange Beach normally fish are now open for fishing. Alabama has the largest artificial-reef program in the nation with over 5,000 public reefs offshore. 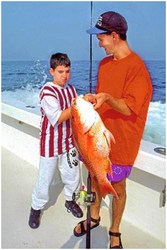 For more information on the fall red snapper season in Orange Beach, visit www.OrangeBeach.com/Fishing. This reopening comes after the National Oceanic and Atmospheric Administration (NOAA) sampled this region from August 31 to November 1 and found that the fish and the shrimp had had no ill effects from the BP oil spill and were safe to catch and eat. On a recent trip close to this area, Captain Johnny Greene of the “Intimidator” charter boat, based out of Orange Beach Marina, in Orange Beach, Ala., caught huge numbers and sizes of fish, highlighted by a 103-pound wahoo, limits of red snapper that weighed from 15- to 20-pounds each and amberjacks weighing from 30- to 45-pounds each, as well as nice-sized grouper and triggerfish. Another surprisingly-large catch of fish was made on Captain Randy Boggs’ head boat, the “Reel Surprise,” on a 6-hour trip, that brought-in limits of snapper weighing 8- to 15-pounds each, grouper, triggerfish and amberjacks. Before the BP oil spill, a 6-hour party-boat trip not only rarely would bring-in as many fish, but the sizes of the fish caught this fall have been extraordinary. The best opportunity to catch the biggest red snapper you’ve ever caught in your life will come to a close at 12:01 am on November 22, the last day of the special fall weekend red snapper season. This year, anglers have caught red snapper averaging 10- to 15-pounds each. Snapper weighing over 20 pounds have been far-more numerous than ever previously. Even though we only have one more weekend to fish for these red snapper, from the size and the number of red snapper that have been brought to the dock this season, the fishermen at Orange Beach are expecting a banner year for these beautiful fish when red snapper season opens again in June, 2011. Although red snapper season is coming to a close, don’t think that fishing out of Orange Beach is ending. Right now, the redfish are pounding the beaches. On a 2-hour trip, Captain Troy Frady of the “Distraction” charter boat docked at Orange Beach Marina in Orange Beach, Ala., caught and released two redfish that weighed more than 20-pounds each. On the Alabama Gulf State Park Pier, anglers are watching redfish pretzel their rods, stretch their lines and cause their drags to squeal. The inshore fishing also is catching fire, with limits of slot-sized reds, 16- to 26-inches long, and a few speckled trout and flounder being caught. Many of the inshore boats are running out into the Gulf of Mexico on calm days to take advantage of the big bull redfish run that should last into February. Although red snapper season ends on Sunday night, Alabama’s Gulf Coast still homes plenty of vermilion snapper, lane snapper, white snapper, triggerfish, grouper and amberjacks. The fall of 2010 has seen some of the biggest vermilion snapper ever coming to the docks. These fish, often called magnum beeliners, weigh as much as 2- to 4-pounds each. With the waters being reopened for fishing by NOAA, Alabama’s Gulf Coast expects to see a bumper crop of giant yellowfin tuna, wahoo, blackfin tuna, swordfish and deep-water grouper. Few people realize how good fishing for tuna can be off Alabama’s Gulf Coast in the winter, but many anglers are learning and are booking tuna-fishing trips right now. To fish with Captain Johnny Greene on the “Intimidator,” visit http://www.gulfshoresdeepseafishing.com, call 251-747-2872, or email him at intimidatorcharters(at)yahoo(dot)com. For more information about SanRoc Cay Marina and to set-up a fishing trip with Captain Randy Boggs, call 251-981-7173, or check-out http://www.sanroccay.com/. To fish with Captain Troy Frady on the “Distraction,” call 251-975-8111, or go to http://www.distractioncharters.com. For more information on fishing guides and charter boats, lodging accommodations, restaurants and entertainment on Alabama’s Gulf Coast, call Gulf Shores & Orange Beach Tourism at 800-745-SAND (7263), or visit http://www.orangebeach.com. You also can get a fishing report three times each week by going to the “What’s Biting?” column at http://www.orangebeach.com/fishing/biting.